All the boats pictured on this site were designed by Westlawn alumni. Click here to see a gallery of alumni designs. Westlawn alumni are prominent in the marine industry. Click here to see more. Click here for information on Westlawn's short continuing education courses. Click here to sign up for Westlawn’s free email journal, The Masthead, with: technical information, what’s happening at Westlawn, and boating industry updates. Click here to order books, apparel and accessories. April 29, 2008 Annapolis, MD: Over the past four decades, Tom Fexas Yacht Design (TFYD) has repeatedly turned to the Westlawn Institute of Marine Technology for first-rate design talent. Most recently, Westlawn alumnus Mark Bowdidge, was placed at TFYD making an incredible seven Westlawn alumni to be employed there. Founded in 1966 by the renowned designer Tom Fexas, Tom Fexas Yacht Design has pioneered some of the most unique and influential powerboat designs of the second half of the 20th century. With about 1,000 vessels to their designs, ranging from 17-ft. launches to 160-ft. motoryachts, the Fexas office has remained incredibly busy for decades, with designs from the famous Midnight Lace series, to projects for Palmer Johnson, Cheoy Lee, American Marine, Burger, Derecktor, Royal Denship, Knight and Carver, Mikelson Yachts, and others. In order to gain the skills needed for such an influential career, Tom took the Westlawn course in yacht and boat design, in addition to his engineering degree from SUNY Maritime. As his office grew and projects piled up, Westlawn continued as one of the principle sources for design talent. TFYD has employed the following Westlawn alumni: Tom Fexas, Jay Coyle, George Rodzon, Earl Alfaro, Stuart Kityama, Nick DiMatteo and Mark Bowdidge. Not only does TFYD rely heavily on Westlawn to supply top-flight talent, but Tom served on Westlawn’s Board of Directors for several years, and TFYD designer Nick DiMatteo was also a Westlawn instructor for several years. Although Tom passed away in 2006, the TFYD office remains busy as ever with numerous projects in all phases from early development through recent completion, and the design firm’s reliance on Westlawn talent and training has continued unabated. Furthermore, Tom’s wife Regina Fexas has taken the reigns as president of TFYD. Deeply involved in TFYD since 1987, she has inspected vessels all over the world and operated their two boats for years. Regina also worked with Tom on his many published articles and in the daily operation of the firm. To further consolidate her knowledge and ensure the continuation of the extraordinary design quality TFYD is known for, Regina has also signed up to take Yacht Design Lite, bringing the total to eight Westlawn people at TFYD over a four-decade relationship. Tom Fexas Yacht Design is one of the foremost yacht design offices in the world, and has been in business since 1966. In 1977, the office was moved from Mystic, Connecticut to Stuart, Florida where it grew from a one-man operation to the staff of seven designers. Tom Fexas Yacht Design, Inc. prides itself on its technical expertise and innovation. Visit www.tomfexas.com for more information on the design firm. 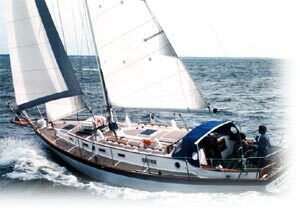 profession of yacht and small-craft naval architecture. ■ To support continued growth of the recreational and small-craft marine community through the development of well-trained, safety-oriented, boat designers developing better products for the benefit of the boating public. ■ To provide continuing education to marine-industry professionals. To learn more about Westlawn, please call (860) 572-7900 or visit the Westlawn website at: www.westlawn.edu.